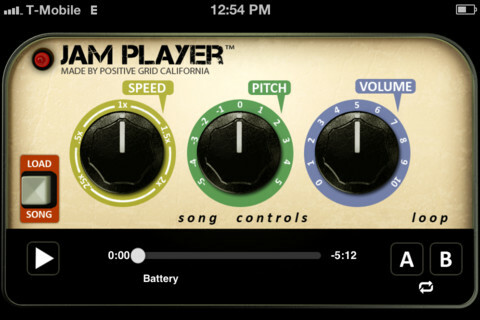 Jam Player is an intuitive iOS app that can manipulate song tempo and pitch, ideal for practice. Positive Grid designed this software to be a powerful pitch and tempo manipulation app, while retaining a very straightforward analog like interface. It lets you seamlessly change the tempo and pitch of the songs in your iPhone, iPad or iPod touch. To use, you simply load a song from your iTunes library on the device. Once loaded you can then play with the speed and pitch control knobs. The Speed knob controls the tempo of the song without affecting its pitch. It is a very powerful practice tool because you can use it to slow music down to a pace that is comfortable to you and speed it up as you progress. Pitch control on the other hand raises or lowers the pitch without affecting tempo. This is very useful for learning songs in a different key to accommodate various singers. Jam Player also comes with a loop features where you can set it to loop a particular part of a song, so you can continually practice on the portion. This is definitely a very nifty app that any working musician will benefit from.